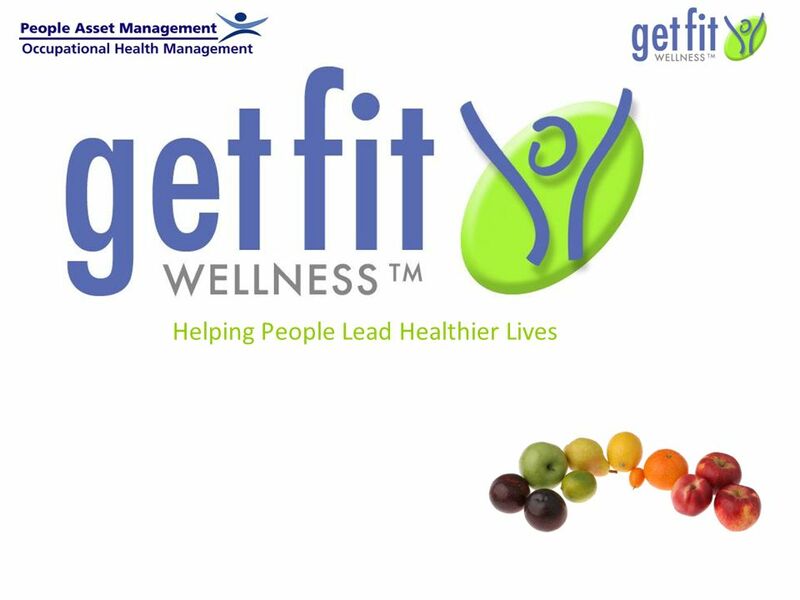 Helping People Lead Healthier Lives GetFit Health Manager. 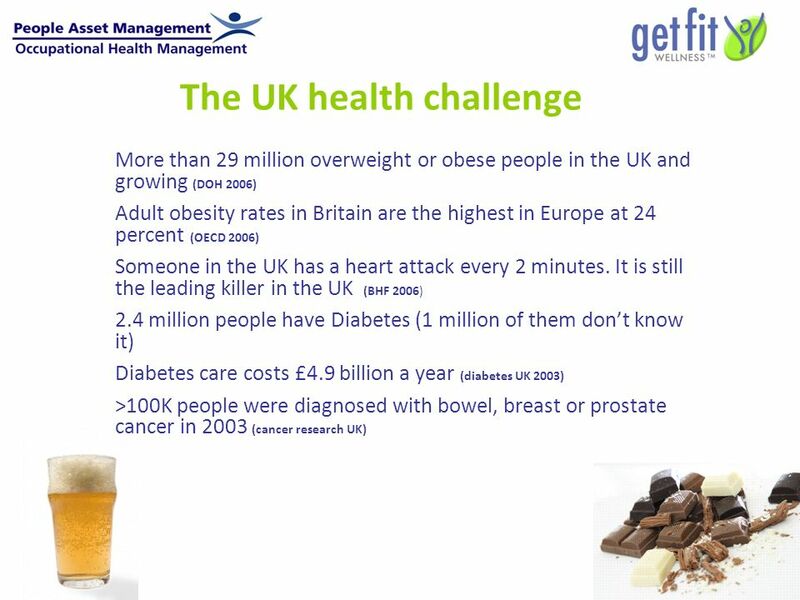 3 The cost of ill health Learning from US trends Obesity is estimated to account for 43% of all healthcare spending by US businesses on employees. Obese workers are more than twice as likely to have high levels of absence as other staff. 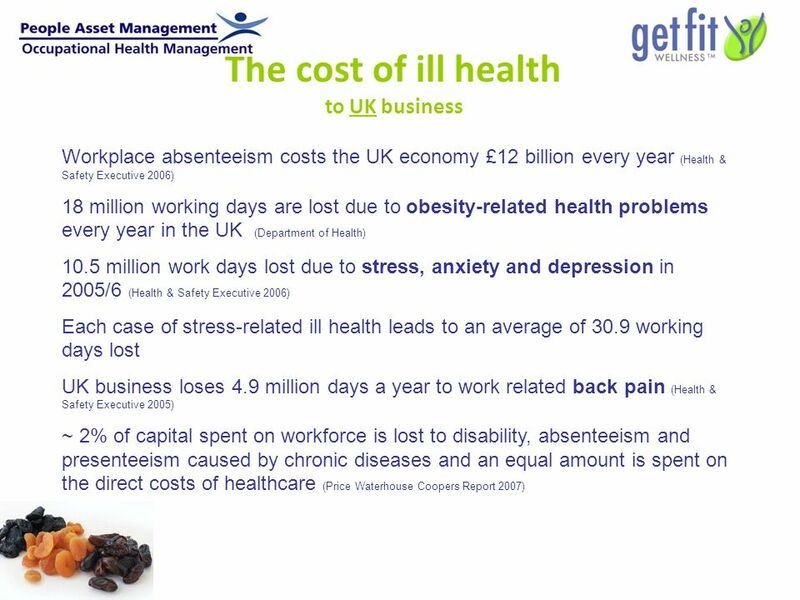 The cost of obesity to an employer with 1,000 workers is $285,000 a year, with increased levels of sickness absence accounting for 30% of this. 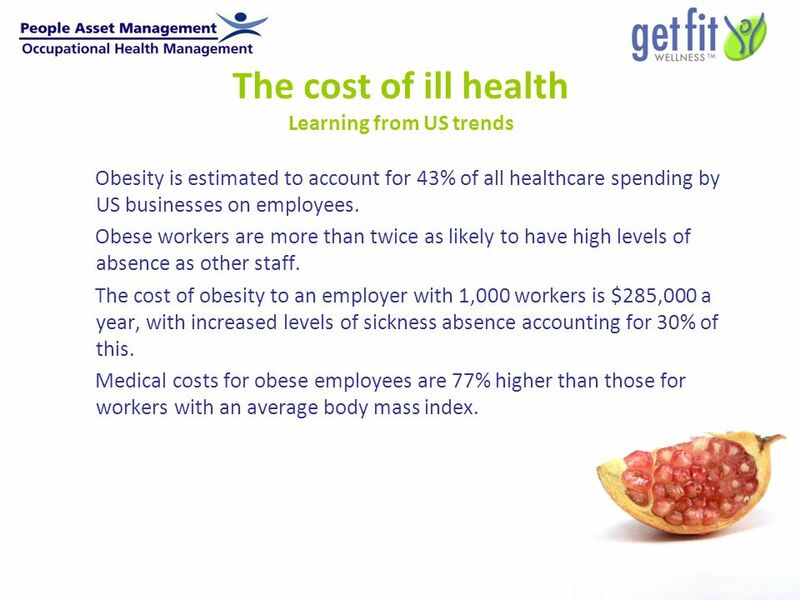 Medical costs for obese employees are 77% higher than those for workers with an average body mass index. 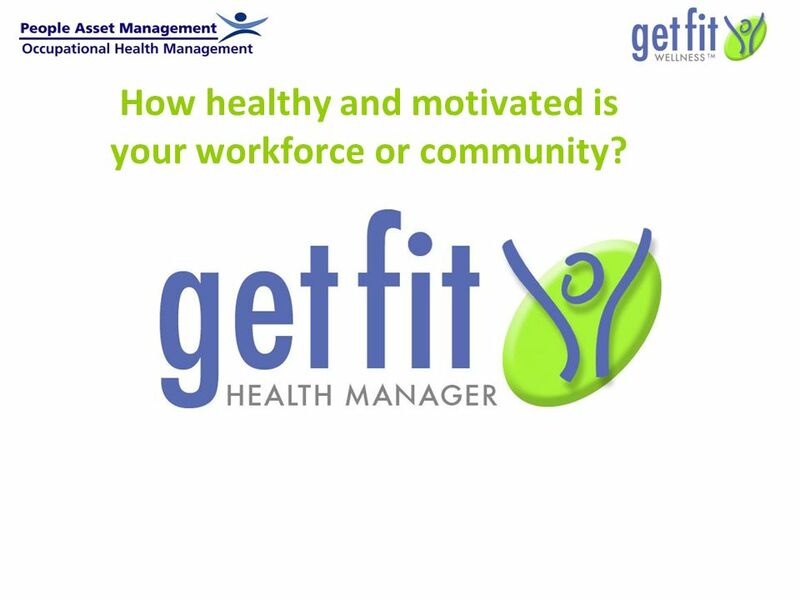 5 How healthy and motivated is your workforce or community? 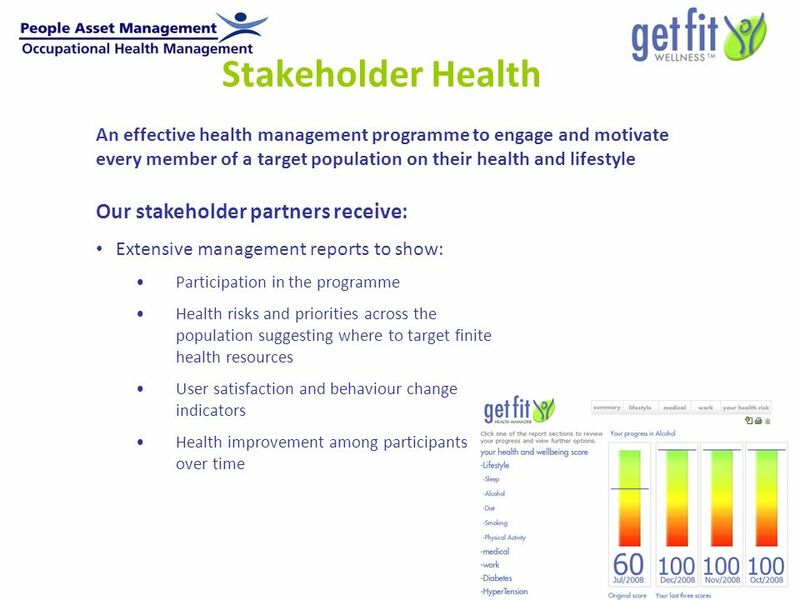 Download ppt "Helping People Lead Healthier Lives GetFit Health Manager." 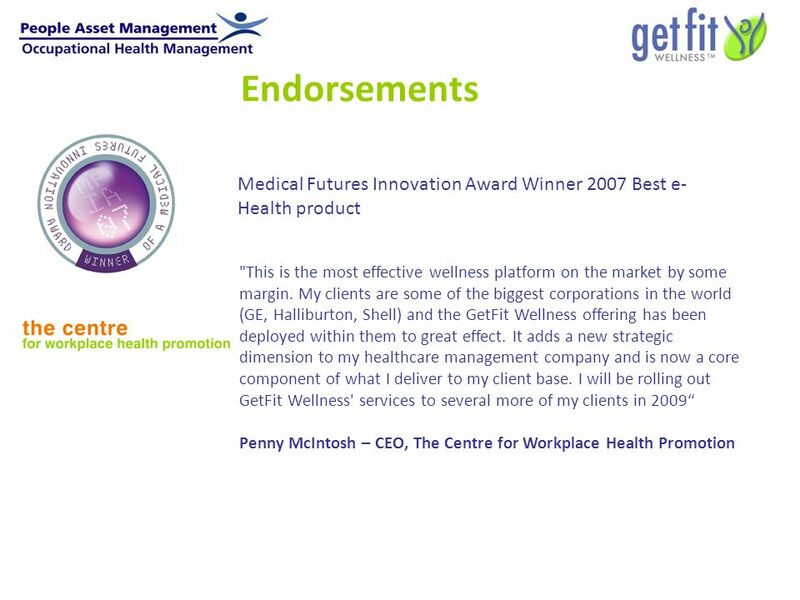 Health Doing Business with the World - The new role of corporate leadership in global development Geneva, September 2007 World Business Council for Sustainable. ECOSOC Western Asia Ministerial Meeting Addressing noncommunicable diseases and injuries: major challenges to sustainable development in the 21st century. Active travel and healthy workplaces Rachel Bromley, Sustrans. 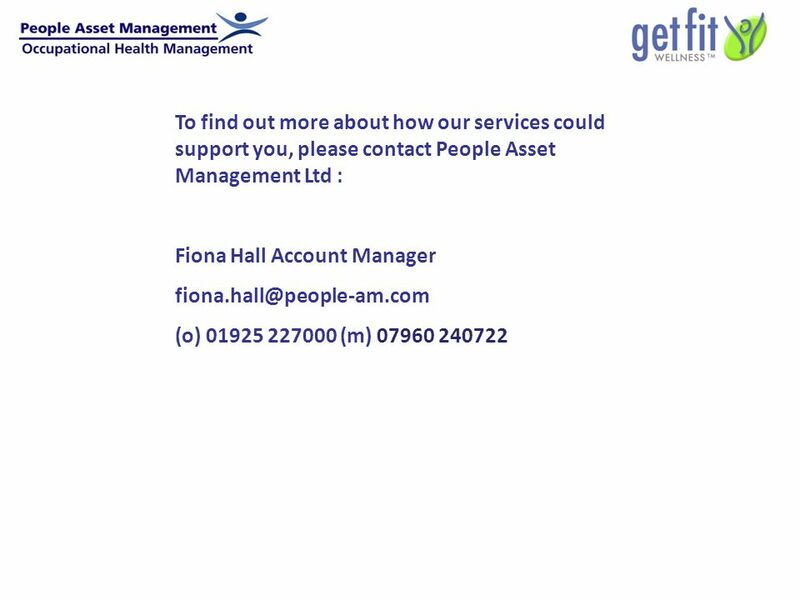 19/3/.2012 Occupational Health In 1994, the UK Health & Safety Executive (HSE) estimated that the overall cost to the British economy of all work accidents. 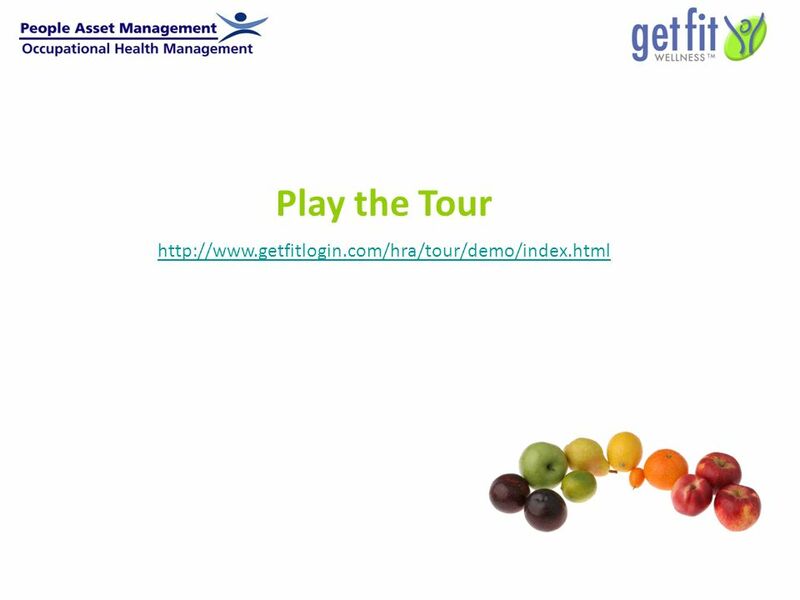 Services provided by Mercer Health & Benefits LLC Total Health Management: On the Verge New York Business Group on Health January 22, 2010. 2012 / 2013 Benefits Open Enrollment Murray School District. Business Action on Public Health Employee Health and Wellbeing Bedfordshire and Luton Employers Practitioner Event ‘Alcohol and its impact on workplace. 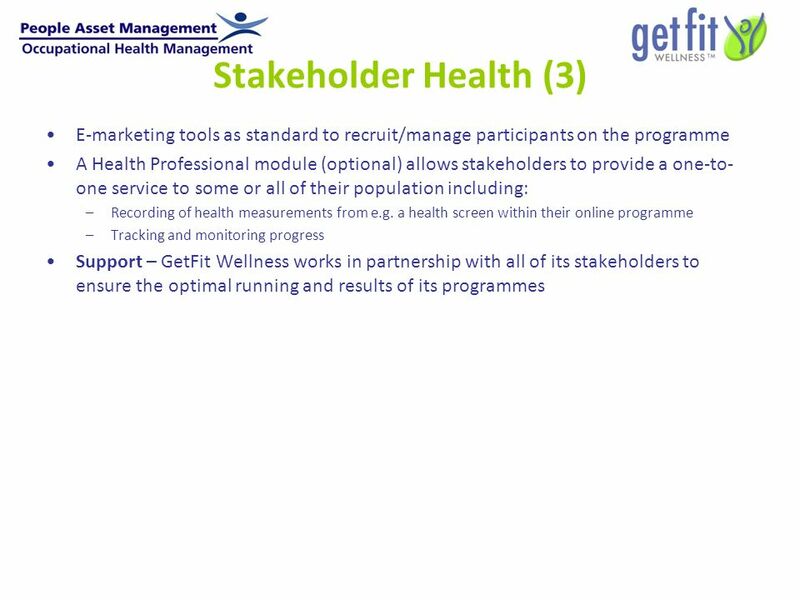 Healthy FE and Skills An introduction for education and training providers September 2013. 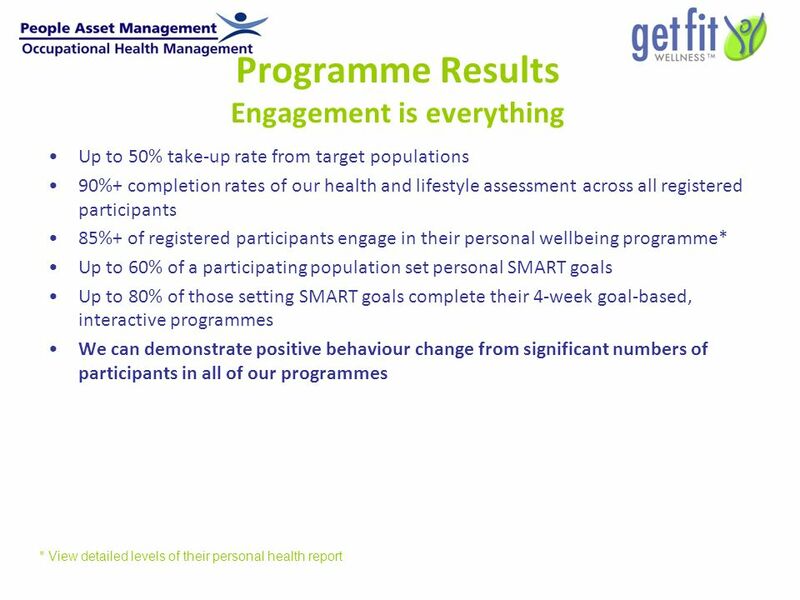 Improving the wider social determinants of health in Sunderland through the Community Wellness Programme Health is a key priority in Sunderland, a legacy. 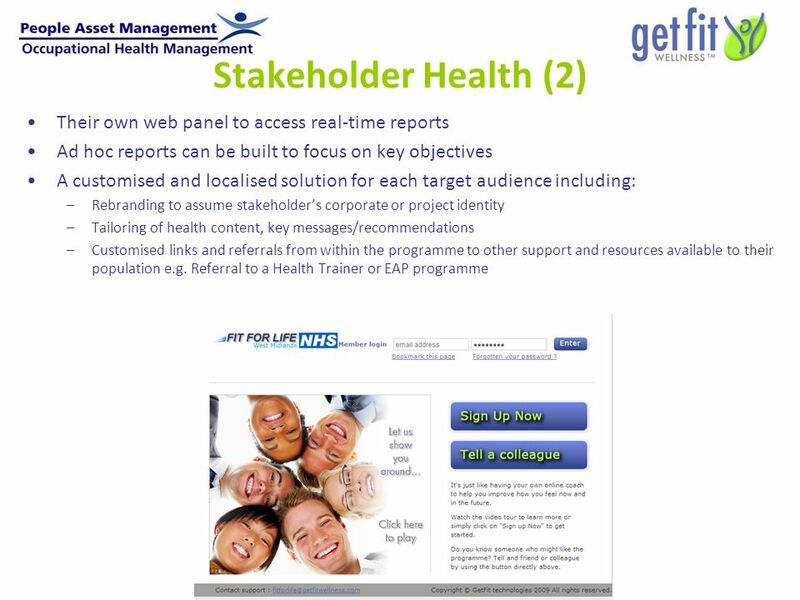 Population Management The following module is designed as a basic overview of population management for providers of healthcare, particularly those in. Keeping well & warm this winter Lifestyle Services Alan Jarvis Head of Adult Lifestyle Services Fran Hancock Health Promotion Specialist for Older People. 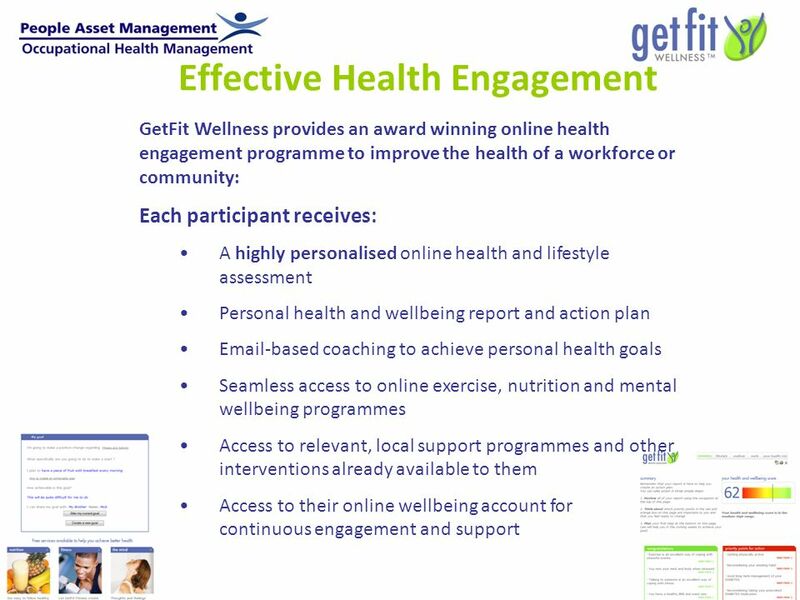 Health Work and Wellbeing Veronica Martin-Gall NHS East of England. 1 Healthcare: Linking Return to Work with Healthcare Outcomes to Lower Costs Barton Margoshes, MD Chief Medical Officer CIGNA Group Insurance.